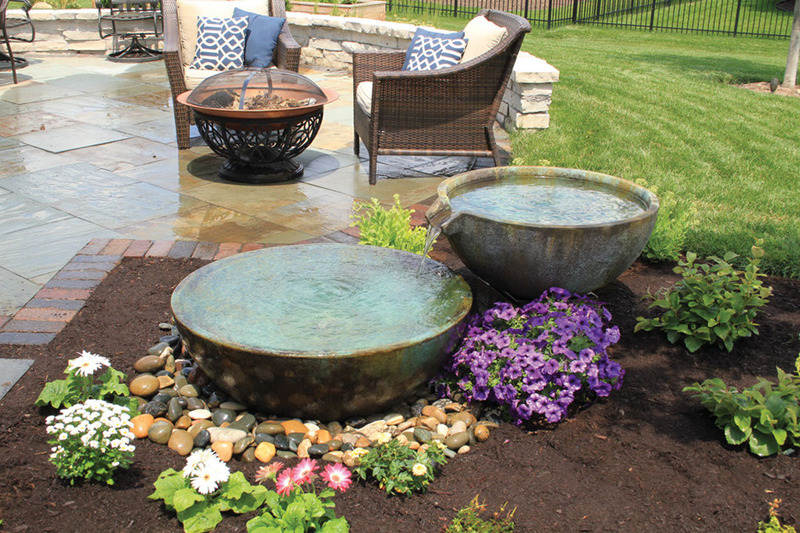 Have you ever wanted to incorporate water into your landscape but didn’t believe you had enough space, or maybe wanted something different than a pond? We’ve heard this many times, and have been able to accommodate our clients. However, a newer feature has been added to the decorative line up. It is called the Aquascape Spillway Bowl. We loved the look of these when they first came out, and now our clients have loved them too. Nothing complicated with the Aquascape Spillway Bowl. Just a simple, yet elegant feature. Entrances, patios, small landscapes…they can compliment any type of landscape, yet the Aquascape Spillway Bowl won’t over power a focal point. While larger water features, like ponds, generally require a full cleaning in the fall and spring that may take a full day to complete, the Aquascape Spillway Bowls can be cleaned much quicker. They also get shut down for winter, so no need to worry about ice dams forming. Most water features are kid friendly, but for those that have very young children that like to explore, as a parent you may worry about something happening near a larger pond. The young explorers can play near the Aquascape Spillway Bowl, or a pondless water feature, while a parent can worry a bit less…(lets face it, all of us parents tend to worry about nearly everything). These Spillway Bowls are also kid approved for fun! Even though though these look great in smaller spaces, near patios or entrances, they also look amazing incorporated into an existing or new pond or pondless water feature. The Aquascape Spillway Bowl is versatile, elegant, and lower maintenance, making them a great choice for the busy people out there, including those with kids. Ready to get your own Spillway Bowl?